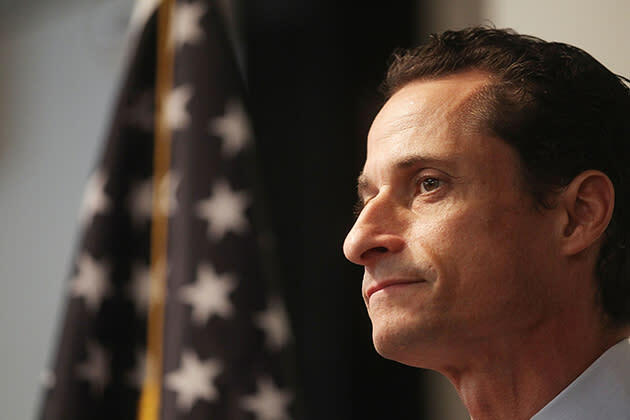 Anthony Weiner, the former congressman who was forced out of office after he was busted sexting with women who were not his wife, says he’s considering a run for New York City mayor this year. But Weiner’s interview—his first major sit-down since being ousted from office two years ago—seems to contradict his claim that he doesn’t have a “burning desire” to run for public office. It comes only weeks after word that he’d spent $100,000 polling New York City voters about whether they would accept him again. And in a sign of how serious he is, the Times article also includes comments from Huma Abedin, a longtime aide to former Secretary of State Hillary Clinton who married Weiner in 2010 who is not known for readily talking to reporters. In the interview, Abedin recalls when her husband first told her of the brewing scandal, in which he was busted for sending lewd photos of himself to women he met on the Internet. Two days after her husband held a press conference to admit the stories about his sexting were true, Abedin was on a plane to Abu Dhabi with Clinton when she says she broke down sobbing. Asked about whether Clinton—who stood by her husband, former President Bill Clinton, after he admitted to an inappropriate relationship with a former White House intern—offered her advice, Abedin suggests she did, but declines to say exactly what. Abedin says she’s forgiven her husband, and both she and Weiner took great lengths to emphasize that after much counseling, he’s a changed man—more focused on their marriage and raising their 15-month-old son, Jordan. Weiner says he has no timeline for when he’ll make a final decision about his possible mayoral bid. But he’d enter the race as a financial front-runner, thanks to more than $4 million he raised for a possible mayoral bid in 2009.